Capri is one of the most photogenic islands in Italy – and it’s only a 20-minute ferry ride away from the Sorrentine Peninsula. In Capri Town, boutiques overflow with linen dresses and designer bags. You can sip an Aperol spritz below the clocktower in Piazza Umberto I or step aboard a boat trip to the Blue Grotto at the Marina Grande. You’ll find Anacapri on the west side of the island. This tiny commune balances a museum and higgledy-piggledy streets on a plateau with magnificent sea views. For more in the way of vistas, jump in the cable car to Mount Solaro, the highest peak on Capri. This event celebrates the patron saint of Capri. A procession will start in the piazetta of Capri Town and continue to Marina Grande before the statue is carried back to the cathedral of Santo Stefano. Saint Anthony is the patron saint of Anacapri and the whole town is decorated with lights and banners in the week leading up to the event. On the day of the feast, a statue of the saint is carried through the town while residents toss rose petals from above. This traditional religious festival celebrates Madonna della Libera with a procession through the fishing village of Marina Grande before a concert is held in the evening. This centrally located in Anacapri has fantastic sea views and an Olympic-sized swimming pool. 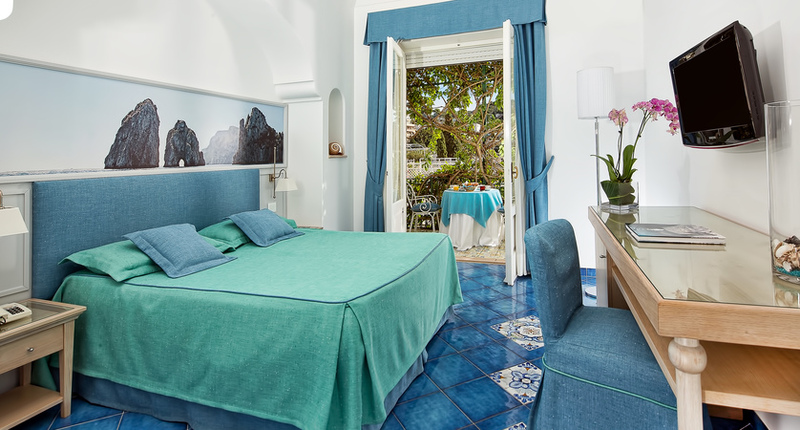 This utterly charming boutique hotel is in the heart of Capri Town, just metres from the piazza and within touching distance of the island’s designer boutiques. An old-school glamour and a warm welcome promise to make for a memorable stay on this glamorous island. 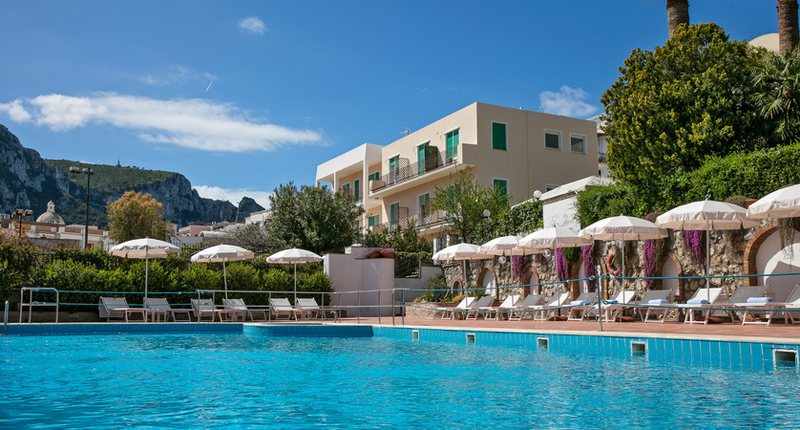 Hotel Syrene offers great value for money in the centre of Capri Town, just a short walk from the piazza and countless designer boutiques. The Blue Grotto is one of Capri’s most popular attractions and a must-do for visitors to the island. Excursions will take you aboard a wooden row boat and navigate calm sea waters through the caves before you enter the sparkling cavern. The azure blue waters sparkle all around the cave and turn it into something truly magical. Villa San Michele was built by Swedish physician, Alex Munthe, who first came to Capri in 1885. The stunning property displays a number of ancient artifacts but the highlight of a visit here is the beautiful botanic gardens and some of the best panoramic views in Capri. The Faraglioni rocks are an iconic sight of Capri. Jutting majestically out of the sea, these rock formations can be seen from various view points on the island or by taking a boat trip. Monte Solaro is the highest point of the island, and where you’ll find the best views. To get there, take the chair lift from Anacapri, which gets to the top in around 12 minutes. Once you’re there you’ll find a restaurant and plenty of spots to relax and take in the views. No trip to Capri would be complete without a bit of shopping. The designer boutiques in Capri Town include Dolce & Gabbana and Gucci, but for a more authentic experience head to one of the island’s sandal makers where you can buy a custom-made pair of shoes or just watch while they work. For a multi-centre holiday, it’s easy to combine a few days on Capri with a stay in the coastal town of Sorrento or the port city of Naples. You could also pair it with a relaxing few days on Ischia or head south along the Neapolitan Riviera to the towns of the picturesque Amalfi Coast.